Precision Waterjet Limited is owned and managed by experts in the Waterjet Cutting field who understand how the demands of Precision Engineering can be met by the waterjet process. We are an ISO 9001:2008 Registered Company. 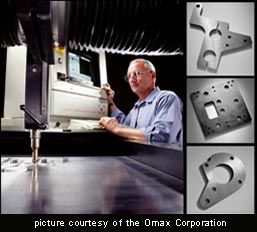 We operate 3 high precision Omax waterjet cutting machines with a cutting tolerance of +/- 0.1mm or better, which will produce a square edged taper free part where required. We hold extensive stocks of stainless steel, aluminium and mild steel plate, and can source most other metal, plastic and composite materials in order to meet Customer requirements. With in house flat bed linishing and graining facilities we can offer a satin grained finish to parts up to 300mm wide. We also have a C02 Laser for etching metals and cutting non metals. We are based in Lyme Regis, Dorset with the ability to satisfy Customers nationwide. Please have a look at the Video clips opposite to see examples of our work and also the abrasive waterjet cutting process in action on one of our machines.